Join us on an expedition to discover the majestic Canadian Rockies, where we'll explore the natural wonders in five of its National Parks. Wildlife abounds in this great land where mountain peaks raise their saw tooth summits to the sky. We've planned this trip at the time when many of the great mammals of North America can be observed with their young. It is also the peak season for many mountain wildflowers, an extra bonus. Our walks bring us into some of North America's most spectacular scenery - in alpine meadows adrift with wildflowers, beside shimmering turquoise lakes, and in view of gleaming glaciers. Countless wonders await us in Jasper, Banff, Waterton Lakes, Yoho and Kootenay National Parks. Our adventure begins in the prairie foothills just east of the Rocky Mountains, at Head-Smashed-In Buffalo Jump. This is a fascinating place, where Native Americans hunted bison. The innovative Visitor's Center is built into a cliff face, and houses fine interpretive exhibits. We'll take a short walk to introduce you to the prairie environment, a striking contrast to the Rocky Mountain landscapes soon to come. We continue to Waterton Lakes National Park, part of the U.S. - Canada International Peace Park. 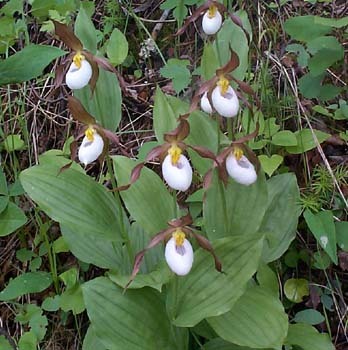 We'll walk in forests of towering Douglas fir and spruce, and in mountain meadows blanketed with glacier lilies and beargrass. The scenery is exquisite. We'll see glacial lakes nestled in hanging valleys, raging waterfalls, and stunning panoramas of Waterton Lake. Our groups have enjoyed outstanding wildlife sightings here - including black bear, grizzly, and bighorn sheep with young. The geology of this area is also interesting - we'll walk over ripple marks preserved in the rocks, telling of a time the Park lay beneath shallow seas. We'll travel north along the scenic Banff-Jasper highway to Lake Louise, a perfect base for our explorations of Kootenay, Banff and Yoho National Parks. Along the way we'll see the famous Paint Pots of Kootenay Park, where cold, iron-rich springs stain the earth deep ochre, and gaze down upon the thundering waterfalls at Marble Canyon. In Yoho National Park, we'll enjoy a walk around lovely Emerald Lake. 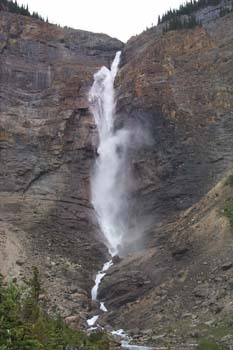 Takakkaw Falls is another highlight, a natural wonder over 900 feet high. 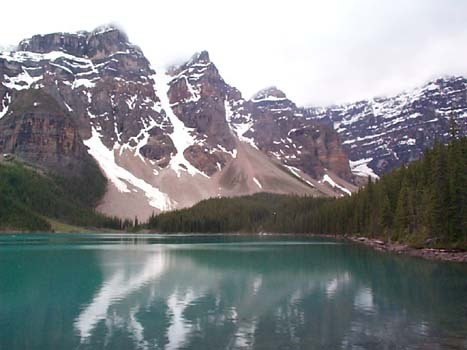 And in Banff National Park, we'll visit Lake Louise, whose tranquil, turquoise waters reflect the spectacular snow-covered peaks of the Canadian Rockies. Our trip continues along one of the most beautiful roads in the world, the Icefields Parkway. We'll see great U-shaped valleys with towering walls, snowy peaks, and glaciers hugging the slopes. Glaciers up close are awe-inspiring: we'll experience that firsthand as we walk on the Athabasca Glacier. We have scheduled three days in the area around Jasper - plenty of time to enjoy its magnificent wildlife, scenery, and wildflowers. We should see golden eagles, falcons, waterfowl, and a variety of songbirds. We have a good chance to spot moose, bighorn sheep, beaver, black bear, and elk. Elk can be so common they dot the roadsides in the evening. At Mount Edith Cavell, we'll enjoy stunning views of a deep glacial valley, with a hanging glacier perched on its north face. We'll take a tram to the top of Whistler's Mountain for a sweeping panorama of the Jasper area, as well as a close-up look at an alpine landscape. We've included some free time here - options include fishing, horseback riding, rafting on the Athabasca River, or even playing a round of golf. Accommodations throughout the trip are in scenic mountain lodges or hotels. We travel in comfortable 15 passenger vans. Like all Nature Discoveries trips, this is a small group trip limited to a maximum of 20 people. The leaders for the expedition are Gene Gartland and Steven Daniel. Gene is on the faculty of SUNY Brockport, and teaches at the Educational Opportunity Center in Rochester. Gene has an MS in Geoscience from the University of Rochester. He has helped many groups discover the wonders of many of the national parks of the western US and Canada. His enthusiasm is contagious! Joining Gene will be Steven Daniel. Steven has led over 140 trips for Nature Discoveries, and is looking forward to returning to the Canadian Rockies, with its abundance of wildlife, wildflowers, butterflies, and birds. * All photographs are taken by Gene Gartland and are the property of Nature Discoveries, Inc.
"I was asked on a scale of 1-10 how was it? My reply, 'a 20!'" "Appreciated the knowledge base and enthusiasm of the leaders." 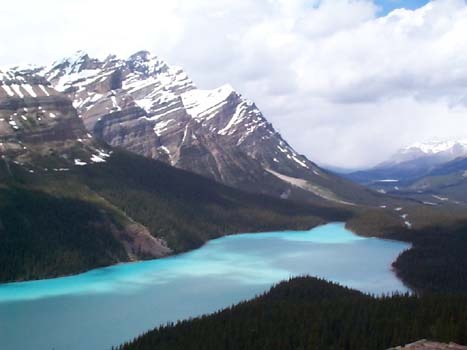 "The Canadian Rockies are awesome in scenery, plant and wildlife." "Wonder, beauty, diversity to a high degree." "I found this trip to be very educational but also fun!" "I rate this trip a perfect 10!" "The Canadian Rockies were marvelous by themselves, but were enhanced substantially by the leaders teaching along the way."